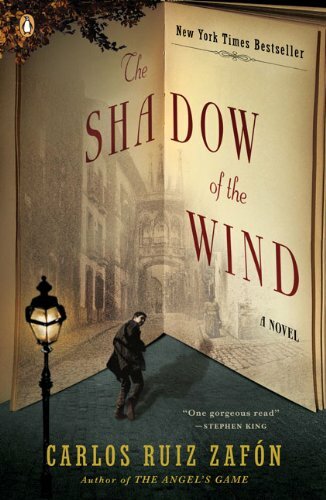 -- Shadow of the Wind by Carlos Ruiz Zafón. I am always slow to read popular books! Who read it already? What did you think? I LOVE books about books. This one was a favourite, totally gripping and beautiful. Like yourself, I always seem to be among the last to read a popular best-seller and this one is no exception. In fact, until I read your post, I had never even really checked out the premise in any great detail and had no idea how totally consuming and intriguing it sounded. As Bev commented, any book about books is an automatic winner for most of us, but this one is a definite 'must read' for me! I also love this particular version of cover art, so much nicer than the traditional version on copies of the book which have crossed my path in the charity shop. I've had this on my tbr for ages! Thanks for sharing! I really love the excerpt. Thanks for mentioning the book! I love love love love love love love Shadow of the wind!! It's one of those "perfect" books. Good writing, good plot, strong characters, different genres combined.... The BEST!!! I haven't read the rest of the series though. I need to. I LOVED this book...an all-time favorite. I HAD to go to Barcelona after reading the book. We found all the places mentioned in the book. The other books he wrote were not as good for me. Ooo! I have always wanted to read this one, although for some reason I keep putting it off. I've had my copy for years . . . One of these days! Thank you, thank you, thank you for sharing this. I'm going to try to pick up a copy today and I'm going to tell my friends about it. Sounds wonderful. Love, love, love Shadow of the Wind. It is so atmospheric and almost creepy. I hope you enjoy it as much as I did. Let me see if I reviewed it. Here is the review I wrote after I read the book three years ago. Great opening from a great book. One of my absolute favourite books. I love all his books. I've wanted to read this one for so long. I should soon.